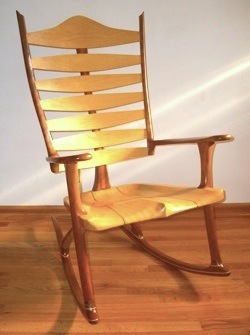 The Hand Made Rocking Chair Seat Really Grabs Your Attention! The hand made rocking chair must reach the highest standards of fit and finish because that's what YOU deserve, and that's my aim. Anything less is unacceptable. When built right, each chair makes a positive statement about you, your taste and expectations. Day after day, year after year, the rocker returns your initial investment with superb comfort, beauty, and peace of mind. The rocking chair is the piece of furniture that lifts your spirits at the end of a busy day. The rocking chair sets the mood. This is only possible by the use of the finest materials and joinery techniques in the hands of a highly talented craftsman. Shoddy workmanship isn't tolerated because the high stresses common to the rocking chair cause inferior parts or joints to fail. Tilting back and forth are a requirement for the successful rocker. Most of the joinery is also on open display for your viewing pleasure, so good looking joints are very important. Beautiful joinery adds so much more to your experience. Below, you will find links to the building process I use when creating your special chair. It's divided into 7 descriptive categories that allow you to gain a better understanding of just how this incredible chair is made. Each category has its own easily-accessible page with descriptions, discussions, and photographs. I'll describe the basic ideas and techniques used in each category and talk about how the choices made affect the benefits received. The categories included are: Joinery, Seat, Back, Slats, Arms, Runners, and Legs. It's no wonder why craftsmen around the world consider the hand made rocking chair the most difficult piece of furniture to make. There are over 250 steps involved with building one custom rocking chair of my design. Other fine craftsmen use similar procedures to the ones described in the categories above. They usually take fewer steps because building the often-used Maloof-style rocker is slightly less complex than the unique style I produce.